Play Age of War 3 game online and build your units to defeat all enemies. You have to find the perfect balance between offence and defence and destroy as many enemies as you can. 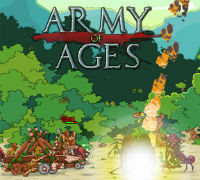 Age of War 3: Army of Ages is the third installment of this popular game. In this strategy game, the main goal is to defeat alien invaders. You can buy and upgrade buildings to bolster your defenses and produce more effective units. Play Age of War 3 and have fun!